A few weeks back, the burger group visited Kalbi Burger. I won't review that here because I didn't get anything with bacon and I didn't drink any beer, but I'd recommend making a stop there to try a burger with some Korean flare. My full review is available on Yelp. Rule #1 in my book is never turn down ice cream. Ice cream is the absolute most perfect food. I mean real ice cream - the kind with high milk fat content and no freezer burn. So the fact that Kalbi Burger sells Coolhaus ice cream sandwiches was just a bonus for our visit. Each ice cream sandwich comes inside a pink box designed to look like a car with wheels on the side, a front window and steering wheel. It's a very clever design for the box considering that the ice cream originated from a truck. I was tempted to keep the box because I liked it so much, but I couldn't really think of what I might do with it, so ultimately I tossed it. Inside the box, I found a sandwich wrapped in plastic and forming that distinct offset shape that Coolhaus presents the sandwiches from their truck in. There are some ice cream sandwiches that aren't soft. The cookies and ice cream freeze in such a way that biting into and enjoying it are made very difficult. 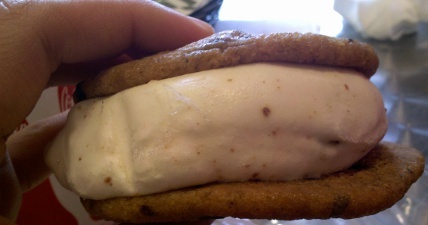 This Coolhaus sandwich is the exact opposite of that. It's actually quite odd - it's so soft it seems like it should melt but it hold together well. 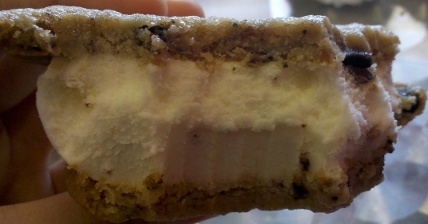 If Coolhaus only served cookies, they'd still be a hit. The cookies are soft and chewy, yet they hold up to the ice cream. Absolutely delicious! The ice cream itself was a surprise to everybody that tried it. I wouldn't call the bacon taste subtle, but it's more of an undertone to a brown sugar/sweet cream flavor that it is at the front of the taste. The bits of bacon strewn about in the perfect bacon to ice cream ratio accent the base flavor quite nicely. 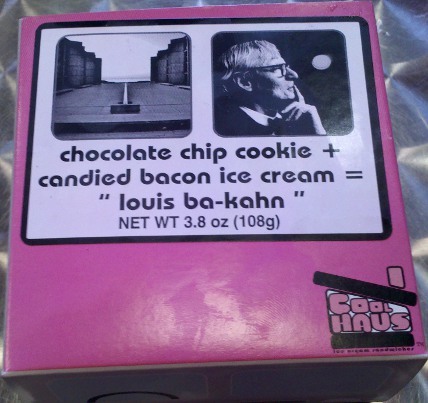 The folks at Coolhaus do an excellent job of bringing out just enough of the bacon flavor without overpowering the more delicate brown sugar/sweet cream flavor of the ice cream. Would I recommend this? You bet! If you can get over the fact that your ice cream has bacon in it. I'm mostly excited to try some more Coolhaus flavors. They execute this one so well, I can only imagine how delicious their other sandwiches are. Hooray!